"Our Oshawa" is an annual publication produced by the City of Oshawa highlighting the past year's community accomplishments. What makes Oshawa an amazing city? We think it's you! Our partners, organizations, service clubs, local businesses and residents make Oshawa a great city and connected community. What's your “Our Oshawa” story? Share your milestones, awards, achievements and community partnerships with us here. Remember to register or log-in before sharing your story. Submit your stories and photos! What's your Oshawa story? Share your accomplishments, good news, and acts of community spirit and read the stories of others. Thank you for submitting your Our Oshawa story. Select stories will be featured on Connect Oshawa - check back soon to read your contribution and the stories of others. The history of our City is rich and diverse. Stories from our history stretch back to the 1400s, and at the Oshawa Museum, we love sharing these stories with our visitors. Through the years, our story telling methods have changed; we continue to host feature exhibitions and tour through our three historic houses, but the digital age has opened up both our audience and possibilities! Born at Oshawa General the same year Oshawa officially became a City (1924), I think it’s safe to say I’ve grown up with Oshawa. Living right on Simcoe St. since I was young, I am an Oshawa-boy through and through; some of my fondest memories are from my family home (my son owns it now) right on Simcoe Street – how things have changed up there by the university! Hi there! I'm Nick and I'm the VP Campus Life at the Trent Durham Student Association. Trent U Durham is the other university in Oshawa. Oshawa has given me the opportunity to build a future. Soon to be a Durham College graduate, I am looking forward to putting to use the advice and experience I learned from my teachers and courses during my time at school. The last three years of my life have been working towards graduating with a diploma and strong portfolio - being able to stand out in the field of Graphic Design and ultimately obtain a job in my field. 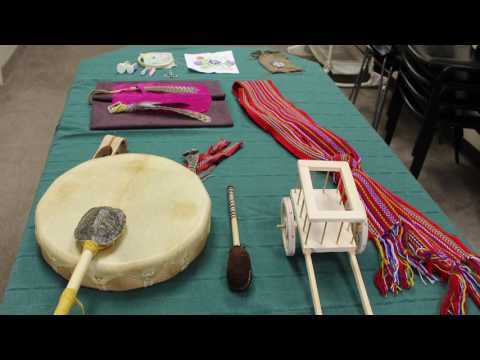 Click here to play video Our Oshawa is raising Métis cultural awareness Featured in the newest Our Oshawa video, the Oshawa and Durham Region Métis Council is committed to raising Métis cultural awareness within the municipality. The video features Kristin Randall, President of the Oshawa and Durham Region Métis Council (O.D.R.M.C. ), discussing the O.D.R.M.C.’s goal of uniting Métis across the region and providing ways to explore their culture. Click here to play video Our Oshawa is a Natural Beauty featuring the Oshawa Peony Festival The City’s latest video for the Our Oshawa campaign captures Oshawa’s natural beauty and takes a closer look at one of the city’s most popular events: the Peony Festival. The video features Judi Denny, Ontario Director of the Canadian Peony Society talking about the Festival and its significance within the Oshawa community. Watch for more videos, coming soon. If you have a story about what #OurOshawa means to you, we want to hear about it. Send them to Connect Oshawa: http://ow.ly/10AF5h. Our Oshawa webpage - read the latest publication!